On Alexei's death his ailing son Fyodor took the throne and the young Peter and his family were driven from the Kremlin to Kolomenskoye, just outside the city. It was here that Peter spent his early childhood and developed his love of sailing, which would eventually lead him to found the Russian Navy and build his magnificent northern Venice, St. Petersburg, on the banks of the River Neva. In 1682 Fyodor died, leaving the throne to a 10-year old Peter and prompting a revolt during which several members of the child's closest family were butchered in front of his very eyes. As a result Peter's retarded sibling Ivan was named co-tsar and his plotting half-sister Sophia became acting Regent. Sophia took the reigns of power in the Kremlin while Peter indulged his boyish fancies and played war with his toy regiments at Preobrazhenskoe. In 1689 Sophia mobilized the streltsy, the Kremlin guards, and threatened to eliminate the young Tsar, but he fled to safety at the Trinity Monastery of St. Sergei in Sergiev Posad and by October Sophir's support had collapsed and she was confined to Moscow's Novodevichy Monastery by way of punishment. 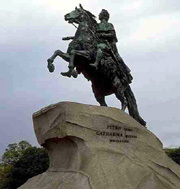 Although just as great a tyrant as either Ivan the Terrible or Stalin, Peter the Great is best remembered for his reforms and his determination in dragging Russia into the modern age. In 1696 the Tsar captured the Turkish fort of Azov, the first Russian victory in several decades, and aired his plans to build a Russian fleet and make the country a force to be reckoned with once more. This very modern Tsar then took a previously unheard of tour around Europe, talking to learned scholars all over the continent, conversing with fellow monarchs, and even travelling incognito to enable him to learn the craft of shipbuilding in the dockyards of Holland and England. In 1698 the streltsy rebelled again but this time Peter was ready and suppressed them with a new guard regiment trained by foreign officers, before having them brutally executed on Red Square. Under Peter's rule, Russia became a great European nation. In 1721, he proclaimed Russia an Empire and was accorded the title of Emperor of All Russia, Great Father of the Fatherland and "The Great". He married twice and had 11 children, many of whom died in infancy. The eldest son from his first marriage, Czarevich Alexei, was convicted of high treason by his father and secretly executed in 1718. Peter died from a chill on January 28, 1725, without nominating an heir. He was buried in the Cathedral of the St. Peter and St. Paul Fortress in St. Petersburg.